I finished my very first handmade wool scarf a few weeks ago. I gave it to friend but now I am thinking about commandeering Lee’s green yarn so I can make another one. The yarn is a tweed made out of baby alpaca hair. Who knows, maybe I might get wild and out of control and try to incorporate a pearl stitch in the next one. Robin, congratulations! It looks great. Don’t you just love knitting? It’s fun, creative, and useful too. Nice scarf. I started knitting two years ago and am so hooked! Now I’m working on a blanket. Can’t wait to see your next piece. ..OK, this is gonna sound odd but I will post it anyway..A* and I have been saving dog fur for the last 7 years..when we brush the dogs we save the down fur..You can send dog fur away and have it spun into yarn and it is supposed to be 80% warmer than regular sheep wool. I don’t really advertise that we save it as it seems sort of crazy but we almost have enough to do a couple of hats..We started saving it as our old dog was growing up as we knew that she would not last forever (shes gone now ) so I wanted to make a hat out of her fur as a keepsake…sort of morbid, sorry. The fur is now a mix of 4 dogs as we also put fur from guest dogs when we dogsit for our friends or family. Boy would I be in the dog hair if I started saving Edgar’s hair. I shave him down about 4 times a year or more. I know some people that have knitted up their dogs hair also. Seems to have that wet dog smell that Phoebe talked about. That R2D2 hat is cute. Robin, I am also making my first scarf! And I also stuck to the basic knit-stitches, haha. I found your blog because I looked up “how to blanch turnips.” And, lo and behold, we got the turnips from my in laws who have a farm. Sounds like we have a lot in common. I look forward to reading more of your blog! 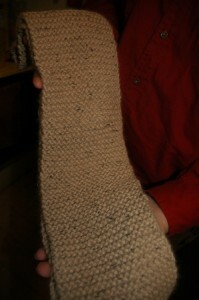 I love that a picture of my scarf is posted on your blog. I forgot all about your blog and then it dawned on me at 4:30am while I’m at work bored that I should catch up a bit on my reading of your entries.